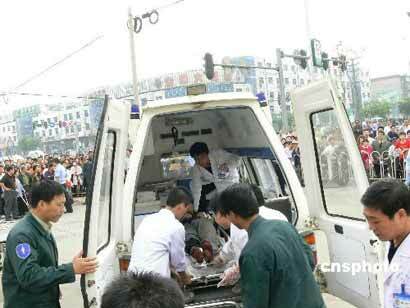 CANGZHOU, Hebei Province -- Three people have been killed and dozens injured after a workshop in a chemical factory in north China exploded, rescuers said on Friday afternoon. The blast occurred at 1:40 p.m. on Friday at a workshop in Cangzhou Dahua TDI Co. Ltd. in Hebei province, according to the provincial work safety bureau. "The blast in the nitration workshop section led to a fire in the toluene supply slot," said Li Li, a spokeswoman for the Cangzhou city government. Most of the injured suffered bruising and scratches to the head and face and are receiving medical treatment. The injured included company workers and local residents. Hospital sources said some workers suffered serious burns and all the injured are being treated in hospital. The fire caused by the blast was put out around 4:30 p.m. on Friday. The workshop's power and water supplies were cut off immediately after the accident and more than 2,000 residents in a nearby village were evacuated in case of a possible toxic gas leak. The company is one of the major TDI producers in China. TDI, or Toluene diisocyanate is primarily used as a chemical intermediate in the production of polyurenthane products. Investigations into the cause of the explosion are underway.